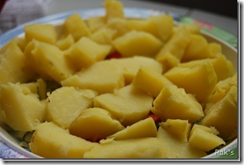 Lean how to make potato curry fully in microwave oven. I know potato curry everybody knows how to make….but this is microwave version. There could be days where we might not be able to use gas stove, say an instance out of stock – gas cylinder or you are put up for a while in an apartment only with microwave. Or you are a bachelor, have microwave and want to cook something. Wash and prick the potatoes in 3,4 places and cook in microwave high for 3 minutes.. I used the stand shown below in picture,which is specific for cooking potatoes in Microwave oven. If you don’t own this stand, no issues, just keep over the rotating platform in outer circle. Make sure to prick so that it does not burst out of pressure. To ensure even cooking,try to change the position of the potatoes in between cooking. say after 2 minutes,change the position and again cook for a minute. Let it cool for 2 minutes,2 minutes standing time is a must..
Peel off the skin and cut into bite sized pieces. In a microwave safe cooking bowl/vessel,add the oil and ajwain/omam ,mix well and keep in microwave high for 2 minutes. Add the chopped onions,mix well and again cook for 3 minutes in high. 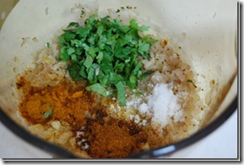 Add the spice powders,chopped coriander and salt and mix well and again cook in high for 2 minutes. Add the cooked potato to it and mix well by sprinkling a very little water,to coat the potato with the spice powder and salt. Cook in high for 4 minutes.In the middle of cooking stir and continue again. Well thats all !! your potato curry is ready to serve as an accompaniment for rice!! And thanks to her for organizing such an useful event…so that we can make use of microwave oven in our day to day life for cooking!!! Great entry for the event. Never tried it in the microwave though. Looks very delicious. Looks lovely..thanks for the entry. Thanks for the step by step procedure. I use MV only for reheating. Nice entry.. I have never tried MW cooking for Sabjis!! That does look very tempting indeed. Very nice recipe! I loved that microwave potato stand too. Looks wonderful Rakhs,great with dosa and chapathi..
Nice idea to add omam! 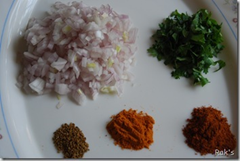 The curry is looking sooo delicious Rajeshwari! 🙂 Who would’nt like a spicy potato curry!? I too was like you at the begining,but my mother in law is my inspiration..she makes even upmas in microwave oven…I too then gradually started using microwave for steaming,making coffee…cooking potatoes..
we must also thank srivalli for encouraging us through her event!! glad that u all like this stand for cooking potatoes…Its very useful and handy for me now a days ..,as some times theres a chance of bursting of potatoes in the regular way if we dont prick it properly..so this one no problem at all!!! ya it sure is great with dosa,chappatis and rice too!! Hi RK, just read your comment..wow abt the mw idli stand!You and mil seem to know a lot many mw gadgets! I heard for the first time abt it..would be more regular visitor here …lot of steps and information being given by you! thanks yet again! wow this looks yummy..ll try it soon!! Looks delicious Raks, and its done in the microwave, the better! 🙂 Hubby and I love potatoes so this one’s on my list no doubt..
Thats cool yaa…potato stand for MW never seen them before, prefect curry..
Nice detailed instruction for a new comer to microwave cooking. This is very easy and simple! Tried it for the first time. Came out fabulously! Thanks a lot!